Touted as one of the best destinations for a weekend escape, Miami has the weather, attractions, and definitely the views to support that claim. And sure, it’s always pretty spectacular in this city, but one time of day shines just a bit brighter. We’ve rounded up the Miami adventures best done at the magical hour of dusk -- when sunsets reign supreme. Miami does rooftops better than anyone. Sugar, the 40th-floor bar atop the hotel EAST, Miami, is no exception. This chic spot in Brickell opened in 2016 and features Asian-inspired cocktails and fare, a nod to the management company’s Hong Kong homebase. This can be seen in drinks like the Lychee Blossom (vodka, sake, and lychee) and the Toki Highball (Suntory Whisky Toki, yuzu, Lagavulin 16, soda). 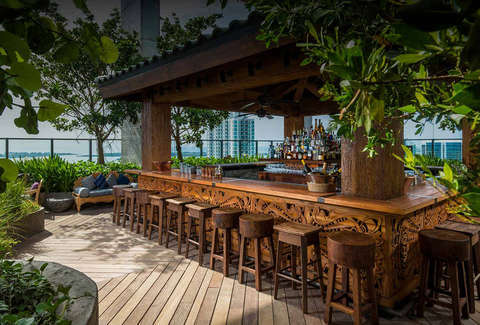 The bar, complete with stone pathways and bonsai trees, feels like a garden oasis in the middle of Japan -- though nowhere in Japan can offer its 360-degree views of Miami, of course. Before you skip right past this, listen here: It’s not just for fishing. A joint effort between the Newport Beachside Hotel & Resort and the City of Sunny Isles, the Newport Fishing Pier was recently rebuilt. 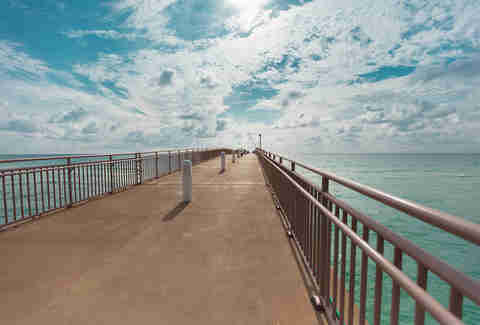 The newly-designed structure extends 776 feet into the ocean, is open 24/7, and costs just $2 to walk and $5 to fish. Hit the beach around 7:30pm and take a romantic stroll -- or even stroll alone -- up and down the pier as the sun sets. There’s no better reset for the mind and body than the ocean breeze. Take the elevator up to the eighth floor of Sonesta Coconut Grove Miami and you’ll find luxury beyond your wildest dreams. That’s because the Panorama Restaurant & Sky Lounge feels like a personal retreat where you can dine, sip on fancy cocktails, recline, and the best part: go for a dip in the pool. Open from sunrise to sunset, you can be swimming and enjoying views of Biscayne Bay as it gets dark -- then move into the restaurant for dinner before heading out on the town. After a perfect beach day, unwind by touring this beautifully designed historic district. 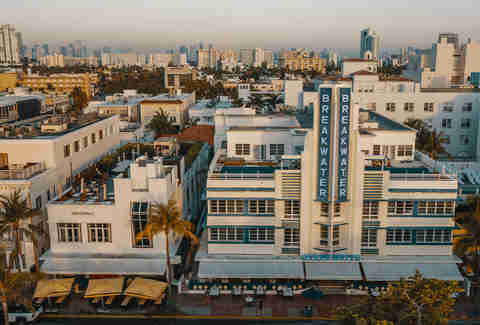 In the 1900s as Miami began growing into a popular tourist destination, developers started putting up hotels and hostels in the Art Deco manner that originated in Paris. These buildings reflect modern style, fine craftsmanship, and rich materials. In Miami specifically, they’re usually bright with neon lights and often have pastel in their color schemes. Strolling along Ocean Drive and Collins Avenue, you’ll see tons of iconic Miami buildings. (And since the sun will just be setting, the neon lights will be in full effect.) Some spots to keep an eye out for include The Webster, a former hotel-turned-luxury fashion boutique and the The Breakwater, a hotel humming with so much incandescence, it illuminates almost all of the surrounding Lummus Park. 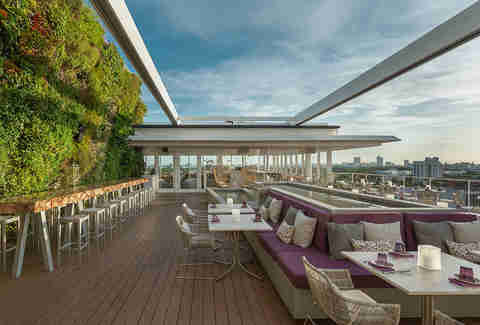 Situated right on Lincoln Road, Juvia Rooftop Bar is a high-end restaurant with views of the harbor and skyline as far as the eyes can see. This, of course, makes it one of the most coveted Instagram spots in town. After feasting on oysters and lobster ceviche, get your dinner partner to art direct a little photo shoot. (After all, you’re already all dressed up.) Luckily, Juvia’s purple color scheme (we’re talking seat cushions, napkins, flowers, candle holders, and even the straws) plus the cityscape in the background do all the work for you. All you need to do is pose and look awesome. And come on, you always do. Feeling your inner hippie? Align your chakras to the rhythm of this low-key, completely unofficial gathering of friends interested in just bonding over some beats. Every month, on the full moon, laid-back types gather at 79th Street & Collins Avenue to welcome Mother Moon back to her full power. You can dance, you can make some new friends who will happily recommend you even more fun off the beaten path in the area, and you can watch firedancers do some amazing feats. When’s the last time you went to a public party, let alone one that came with a private circus? Though it’s unfortunately not a wonderland filled with hammocks for you to nap in, it is a lush, 630-acre respite open from sunrise to sunset. With a full-service marina, trails, beaches, and a restaurant, it’s easy to spend the whole day here kiteboarding, kayaking, paddleboarding, or just exploring. End your Matheson experience with a picnic on the beach -- since it’ll be pretty hard to find your way out of the forest after dark. Pick a table, any table. 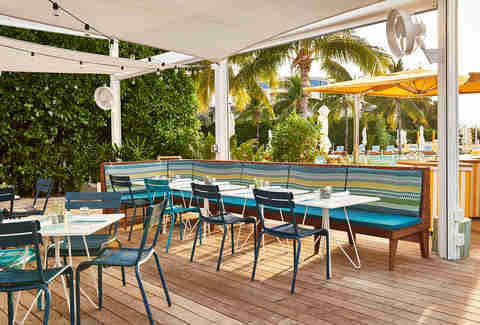 It truly doesn’t matter which because every seat at The Standard Hotel’s Lido Bayside Grill has a view of stunning Biscayne Bay. Cozy up with someone special and a bottle of prosecco (or Dom Perignon if you’re feeling fancy) and let the sunset fully encase you. If you get hungry, Lido is known for its Mediterranean bites (like a classic mezze plate complete with hummus, tzatziki, roasted eggplant spread, mixed olives, and za’atar baked pita) and all-around extensive menu. Pro tip: Make a reservation; this is a coveted sunset spot. Half the fun of Miami is seeing it by boat. But don’t think you need to befriend a millionaire at the club to get out on the water. The Caribbean Spirit is a much-loved way to enjoy a yacht experience. At 78 feet long, this catamaran will definitely impress your Instagram followers with your yachtitude even before you snap that perfect pic of the setting sun glinting off the buildings. And at 125 passengers, it’s big enough to make friends, but not so small you’ll have awkward silences -- basically it’s like that bar you love, but floating in the bay. Oh, and it actually is a tiki bar, and you should totally opt for the open bar after you’ve gone swimming and snorkeling. Now name the bar on land that offers free snacks and soft drinks or lets you bring your own cooler. So come for the perfect location, stay for the ideal hangout. After all that, the night’s just getting started. 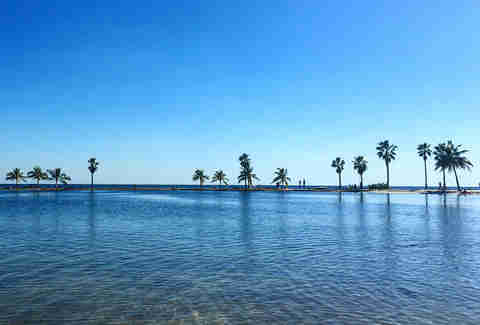 Get lost in paradise with some of the ideas on FoundinMiami.com.